According to TIME, the average human attention span is only eight seconds long. Compare this to the goldfish at nine seconds. Eight seconds. That’s how much time marketers have to grab consumers’ attention and drive engagement. When it comes to marketing online, the time can be cut even shorter. For online marketing, the simpler, the better. Online consumers typically have a very low tolerance for long, drawn-out content that isn’t aesthetically appealing. The easier content is to consume, the better conversion rates will be for online marketers. Cue: the infographic. Infographics include information for consumers, but in a way that’s visually appealing, with short, impactful tidbits of content. But, how do marketers create infographics? Today we share five steps to creating the perfect infographic. 1. Decide what you want to say. First and foremost, decide what you want your infographic to be about. You don’t want to just throw together random information and hope it finds cohesiveness. Consider the story you want to tell in your marketing. What do you want consumers to know about your brand, and how can this infographic tell them that? For example, a professional marketing company might want to position its brand as the expert on all things related to online marketing. So, their infographic could share insightful information on how online marketing differs across different media, such as a desktop computer, tablet or smartphone. An infographic like this tells an interesting story for consumers, while simultaneously benefitting the brand that created it. Once you have an idea about what you want your infographic to say, collect the data and information necessary to say it. This part is important: do not shape information to fit what you want to say; rather, shape your thoughts to fit the information. The last thing you want is for your infographic to appear biased or even untrue. If you find data which strongly contradicts what you hoped to say, then reconsider your position on a topic. Find valuable, research-driven insight to include in your infographic, from sources worth citing. Next, choose an infographic template to display your information on. 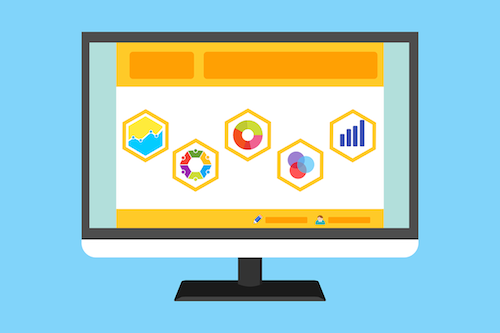 There are a variety of different templates to choose from, everything from office applications on your computer to online tools such as Visme, Google Charts or Piktochart. Research different sources beforehand to find ones which fit your brand, desired story or even your budget. Or, if you have a graphic designer handy, skip the template and draft your own infographic from scratch. This allows you to completely customize the infographic exactly to your own parameters. Whether or not you choose to utilize a template, the next step is to customize the content for your infographic. Here’s where you include all of the information and data you gathered, but in a simplified, easily digestible way. The infographic should tell a story one simple sentence (or less) at a time, from Point A, to Point B, all the way down to Point Z. Make sure your content is easy to understand, while at the same time sharing significant information consumers should know. Look up additional infographics online for ideas for how best to simplify your content. Finally, once your infographic is created, saved and ready to go, it’s time to share! Use your infographic as a source of content to promote your brand, through your website, blog, social media or email marketing. Share the infographic with current or potential clients as a way to promote your services and establish your brand as the expert in your field. When it comes to online marketing, infographics are extremely valuable. Though they may seem difficult to create, they don’t have to be. Follow these five simple steps the next time you want to create the perfect infographic to grow your brand.